When you couple ultracapacitors with lithium batteries performance of an electric vehicle is dramatically boosted. Ultracapacitors give electric vehicles the instant response needed to get going, recover braking energy, work across a wide temperature range, and charge very quickly for thousands or millions of cycles. There is more out there than Eestor, and some are going to market right now. San Diego-based Maxwell thinks it has a cost-effective solution for carmakers. The company makes the K2 2000 ultracapacitor a unit about the size of a soda can that could be of excellent strategic use with electric vehicles. Maxwell Technologies is supplying a major European automaker that expects to release a hybrid vehicle this year that couples advanced batteries with the company’s ultracapacitors. Maxwell's Ultracapacitor. No larger image available. Maxwell is suggesting they have a partner in the European deal, the $30 billion Continental AG parts supplier, who is a competitor to Bosch in Europe. Continental expanded recently with acquisition of another high-profile European auto supplier, Siemens VDO, in 2007. These are not firms that go to market with immature technology. The primary driver for Maxwell is the European fuel economy standards, which strongly incentivizes “start stop technology” where the engine is always shut down for a stop. The technology is expected to be employed across Europe in the majority of new cars by 2015 in addition to the “Micro-hybrids” that are already selling well. For the U.S. start stop isn’t likely, as the fuel economy advantage isn’t credited by the EPA’s system –no incentive payoff – technology denied. 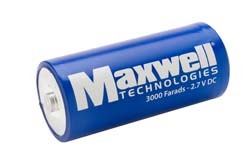 Maxwell’s ultracapacitors are installed in about 2,000 hybrid buses with regenerative braking. The firm is involved in the Ford Transit Connect electric van with Azure Dynamics. These and other automotive ultracapacitor projects have pushed Maxwell sales from $57 million in 2007 to $100 million in 2009. Meanwhile, Eestor has gotten its saga into trouble. Words like ridiculous, mystical and sham are coming out from various writers. The hard facts are Eestor has missed its own promise to introduce and show the world a working ultracapacitor by the end of last year. Now that a full calendar quarter has passed and most of another month, the credibility matter is the lead Eestor item for news and blogs. To add injury to the situation, a major source of information, the tiny ZENN Motors, has stopped building their cars entirely, leaving the firm with nothing other than its license with Eestor for any form of revenue. ZENN seems to dream of being the sole supplier of Eestor ultracapacitors to automotive capacitors. The question is quickly becoming will there be a ZENN at all if the Eestor products do come to market. Technology never waits, even when you’re Eestor. Last week saw Popular Science cover the “Electric Luxury Racer” an exercise in engineering with the latest technology. Of note the vehicle sports a graphene-based ultracapacitor—a device currently being developed in university labs, which uses sheets of carbon only one atom thick to store twice as much electricity as today’s capacitors offering immediate bursts of power. The question is will the unnamed university labs come up with production prototypes. Doubling capacitor storage might not get the idea to ultracapacitor status, but graphene-based caps seem quite possible. The face of the capacitor market is changing fast. Ioxus of Oneonta New York has announced 1,000-, 3,000- and 5,000-Farad (F) ultracapacitors. These are quite different numbers from micro or pico farads. 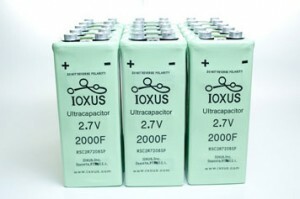 Ioxus prides itself with smaller dimensions packed in rectangles that offer more power density than the competition. Right now ultracapacitors can be used as rechargeable energy storage devices to prolong the lifespan of other energy sources, such as batteries. They are lightweight, weighing one-fifth the weight of a comparable battery, and their manufacture and disposal has no detrimental effects to the environment. Ultracapacitors can take on all of the power functions, except for extended time operation, and this is actually only dependent on the ultracapacitor system size. The state of charge of the battery array does not affect the characteristics of ultracapacitor energy delivery capability. Due to buffering by the ultracapacitor array, the battery array is not subjected to large current loading, which makes its operating conditions, under all conditions of line and load more moderate, extending the battery life. It’s very hard to imagine a smart electric power storage system without ultracapacitor support. One of the more interesting capacitor applications can be seen on the Ioxus site where they offer a white paper about capacitor use for starting diesel locomotives in Russia. Will Eestor get from stealth mode to supplying working samples to amaze and impress all of us? Time will tell, but a near four-month delay on a one’s own announcement doesn’t encourage folks. In the meantime there are ultracapacitors out there. Maybe the available products are not so amazing as the Eestor leaked power, but the real products are intensely valuable for supporting electrification of transportation. Thanks for your insight for the great posting. I’m glad I’ve taken the time to see this.